July 2012 Wood News is out! The July issue of Wood News Online is now available. If you are suffering from woodworking daydreams while you are stuck at work, this may be just the distraction you need. Or it may just make your daydreams worse! Steven Johnson, our Down to Earth Woodworker, has been experimenting this month to try to settle the controversy about putting finishing rags in a plastic bag – take a look at his column to see what he learned! We’ve also got another great woodworking book review from J. Norman Reid – this month he is reading Blanket Chests – a book that he says has inspired him to ‘a higher level of craftsmanship’. And speaking of a higher level of craftsmanship, this month we caught up with Charlie Kested, the Navy Veteran who carved the entire Declaration of Independence with his scrollsaw. See what he is doing now, and much more in our July issue! Go take a look! Take a look at the September 2012 Wood News Online! November 2012 Wood News: Ready for you to Read! 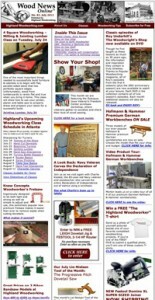 Check out the July 2011 Wood News!